I’ve often thought we need to expand our color vocabulary in the livestock world. Each of the animals in this photo is red, except maybe the lone piglet which I would non-creatively call tan and white. 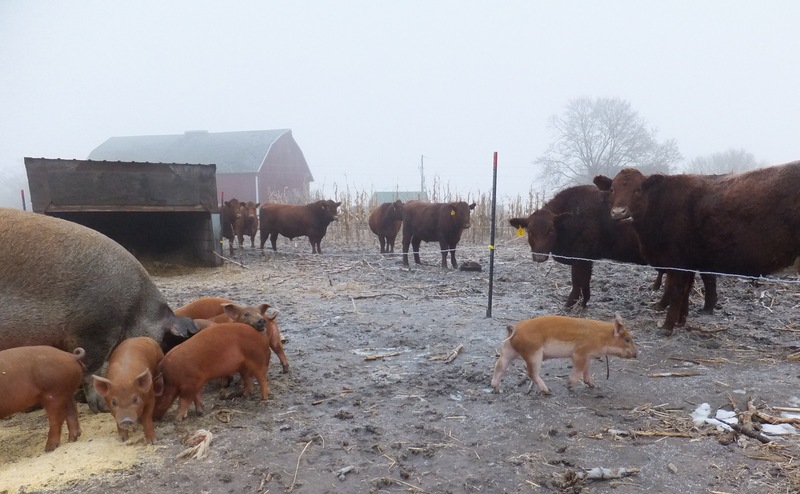 The breeds in this photo are predominantly Red Angus for the cattle, and Duroc for the swine. Each of these breeds can vary from tan to dark red. But we cattle and swine farmers just stick to “red” when describing all of them. Horse people are a little more creative: Chestnut, which includes Liver, Sorrel, and Blond; Bay, which includes Dark Bay, Blood Bay, and Brown; Champagne; and others I’m sure. But I’ve always considered Horse people crazy, surpassed only by Dog people. But writing this has made me realize I’m probably missing out on a marketing opportunity by not creatively describing my animals. 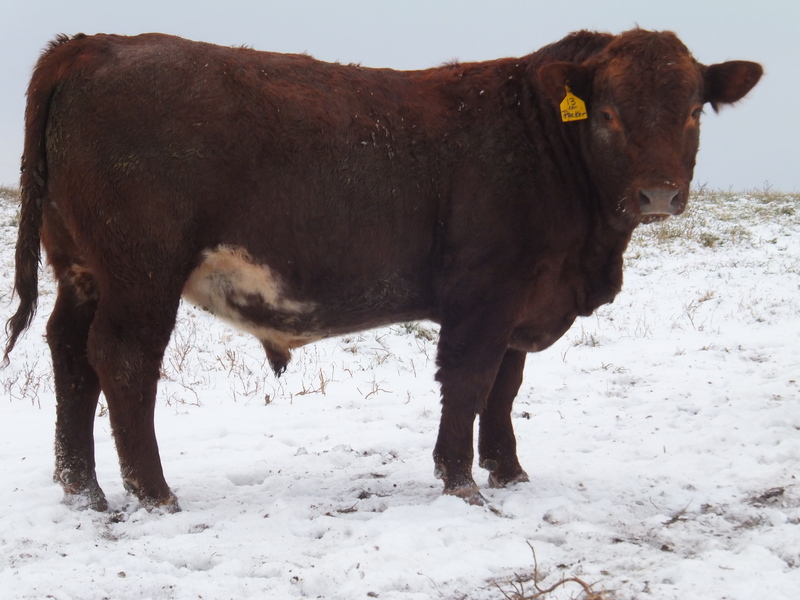 Some Shorthorn breeders have done this by crossing Red Angus with Shorthorn and marketing the resulting crossbred bull as a Durham Red. When I used to sell a lot of boars, I sold two crossbred lines called the Oak Grove Red and Oak Grove Blue. That worked really well for me as farmers would alternate Red and Blue boars annually, and it was easy for them to remember. So I’ve thought myself into a circle. Livestock farmers, we need more colors for our livestock. Horse people, I still think you are crazy, but you are right on the money describing the color of your horses! This bull is fifteen months old. He was born August, 2013. Wintered on his mama’s milk and hay. Weaned onto spring pastures in May. Grazed Driftless region pastures and hay fields for another six months. And now stands there weighing close to 1300 lbs. His shrunk, sale barn weight was 1260 lbs, a few days later. If you are a cattle farmer, the above paragraph may be difficult to believe. If I heard this story a few years ago, I would have found it difficult to believe, and would have been on the lookout for qualifier words. Qualifier words are used to hedge a statement. They give the speaker wiggle room. I hear the qualifier and break it down into fact and wish. The fact in this statement is that the speaker does not exercise every day. A good guess is that the speaker wishes he exercised every day. I used one qualifying statement in the first paragraph. Can you find it? I said he weighed “close to” 1300 lbs. The fact is he did not weight 1300 lbs, or I had no way to know for sure what he weighed, hence the qualifier. If I ended the first paragraph on that sentence, it would have neutered the whole paragraph. It would have been a list of what I did, followed with a guess statistic. If that was all I had, I probably wouldn’t have bothered to write this post, as I’ve written before about how I manage my fall-calving herd. But the sale-barn weight, an actual pay-weight, gives heft to the story. Standing next to the bull in the middle photo, and in the bottom photo, is a fall-calved steer, similar age as the bull. The steer did well and weighs around 1100 lbs. Steers don’t gain as fast as bulls. 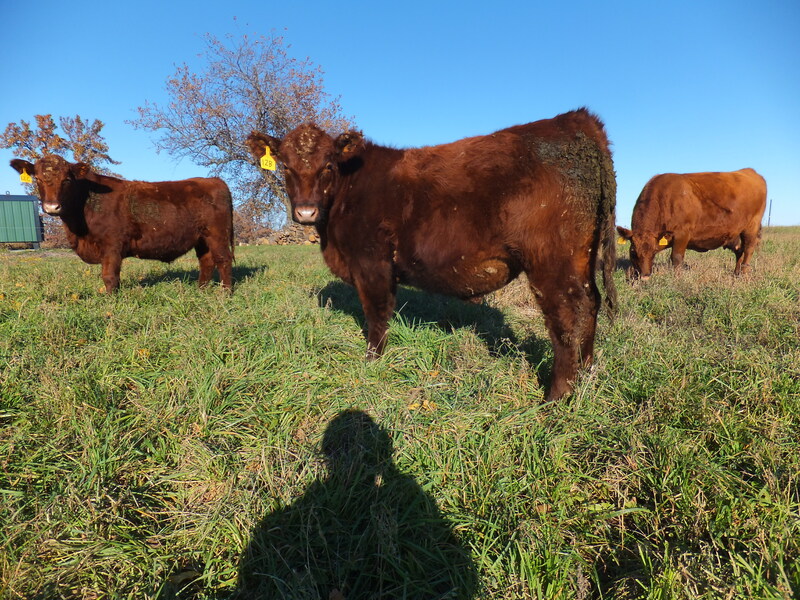 I sold most of my fall-calved yearlings, but plan to keep this steer and three others through the winter so we can have beef quicker next spring for our farmer’s markets. They’ll probably be butchered after a month of good grass in the spring. Why did we have a yearling bull? He looked tremendous as a calf, so I sold him to my parents to be used later as a breeder. They later had second thoughts about the temperament of the genetics from that line, so we sold him. I was disappointed as I thought he was a tremendous bull, but this blog post is a way to make lemonade, I guess. We probably wouldn’t have know his true weight if we hadn’t have sold him, which brings us around to the title. I never cease to be thankful for the richness of the grass in the Driftless region. There must be some sort of dubious record I am setting this year. The top photo was taken July 6th. It shows the contour strips, which is how we farm the hillsides in Wisconsin to prevent soil erosion. The green in the foreground is a little strip of hay next to the road which was cut and baled in June. Next up in the photo is very mature, cut hay. Yes, the last of first cutting was made in July. 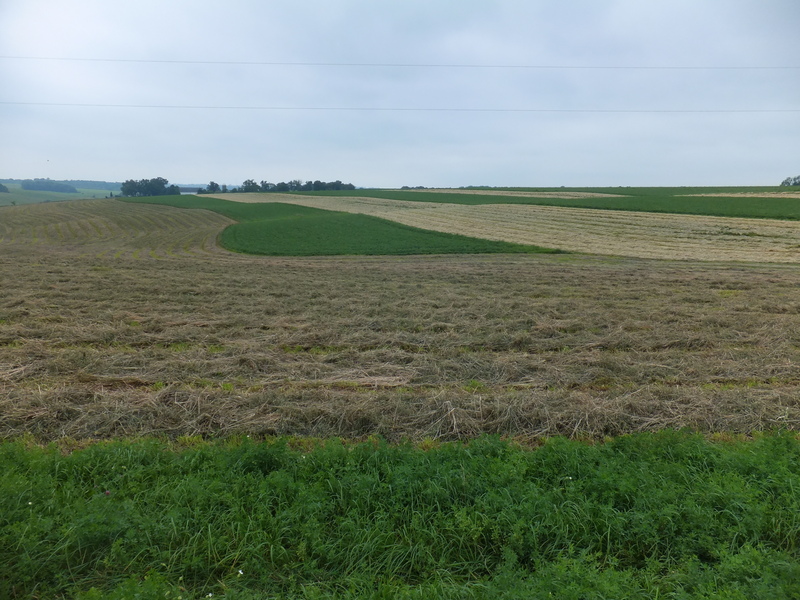 The green strip in the middle of the photo is hay which was cut and baled in May, and is now ready to be cut for a second time. The light colored strip above that is my oats and hay new seeding which is cut and drying, waiting to be baled. So, yes, I made first cutting hay in May, June, and July. I know of no other farmer who is as on the ball, and behind, as myself. At least I’m still laughing. The bottom photo shows my sweet corn on June 26th. 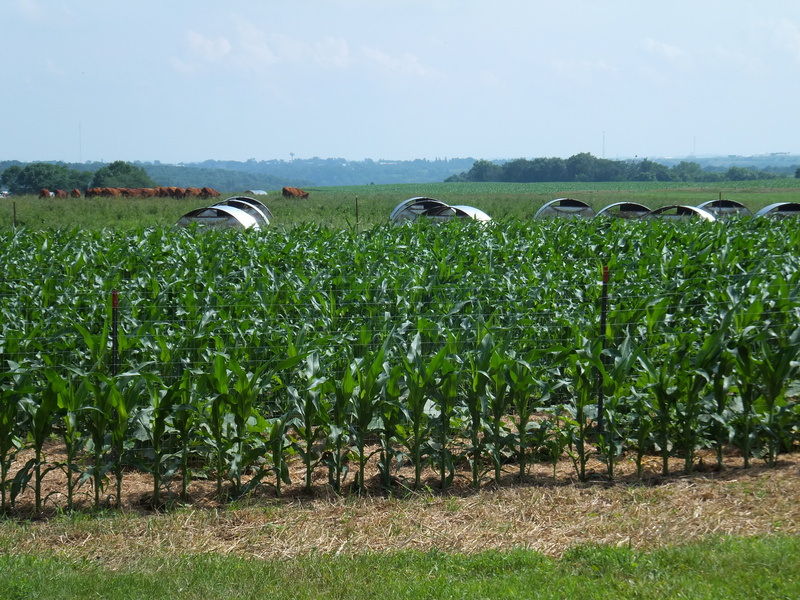 Beyond the sweet corn are the farrowing huts. I’ve had 14 beautiful June litters. Beyond the farrowing huts are my grass-finished steers. I started them grazing hay fields at the end of June. 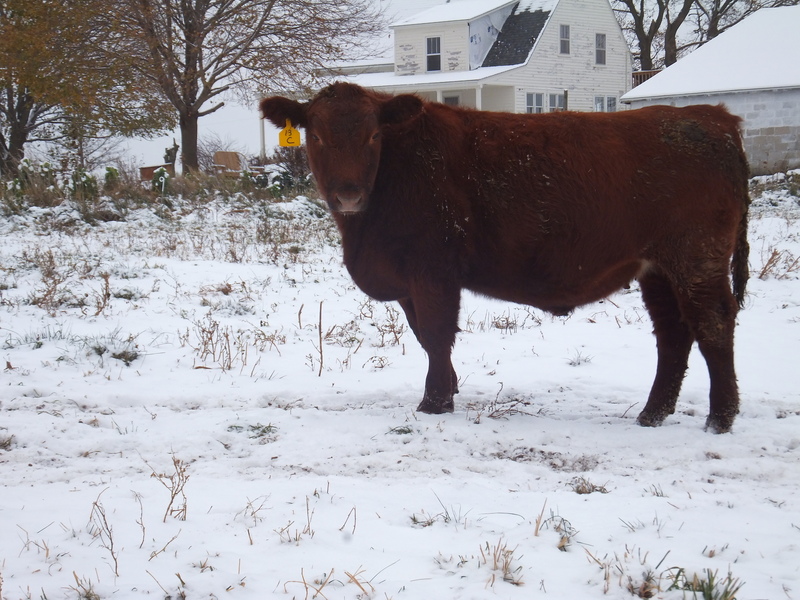 Bruce King asks, “why fall calving?” The short answer is “serendipity”. The long answer is the rest of this post. When I split my farm from my parents’ farm, I had to figure out how I was going to farm and keep the beef and pork markets I had built up with Jordandal Farms supplied. With a much smaller land base I realized I would need to purchase more of my inputs. So I started purchasing spring-born feeder steers in October when they were weaned from their moms. I take the steers through the winter on stored feed, shooting for a pound and a half gain per head per day. They then go onto the lush spring pastures, gaining three pounds per day in May and June. I start butchering the biggest steers at the end of June weighing around 1000 lbs. As the summer pastures fade I start to graze hay fields to keep high-quality feed available at all times. I continue butchering the biggest steers at a rate of eight per month and they’re all gone by October. But back to the fall-calving herd. Even though I realized I needed to buy feeder steers to keep my market supplied, I was a little sad I wouldn’t have any cows or calves. The breeding through birth process is always fun to experience. But the fall before our farms split up saw many cows returning to estrus, after the herd bulls had been removed. This is a bad sign because it means the cows are “open” and will not have a calf the next spring. We sell almost all of the open cows for beef, as it doesn’t pay to feed a cow for a nonproductive year. 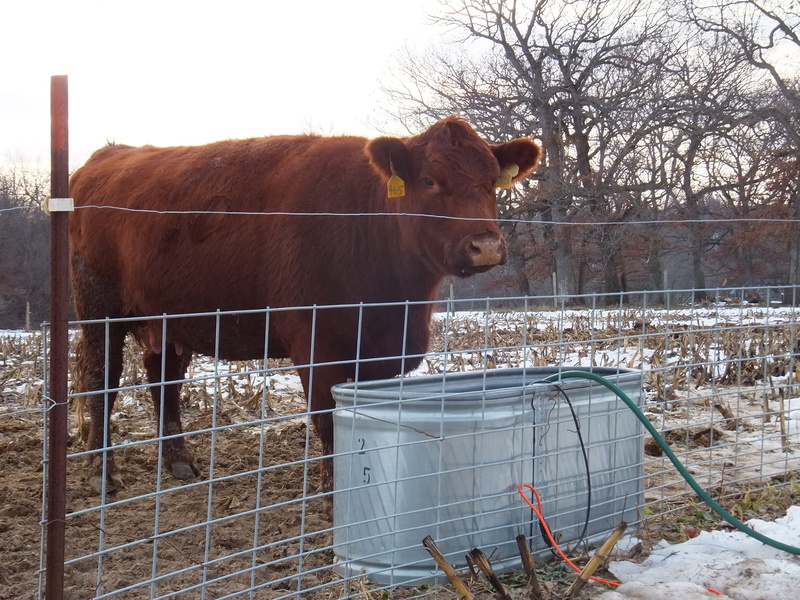 But in a bit of serendipity, the neighbor’s bull jumped the fence and spent a month with our cows. When the veterinarian pregnancy-checked our cows, sure enough many were open, more than usual. Some of the cows we considered best in the herd. I realized some of these cows may be short-bred by the neighbor’s bull, (less than a month and the vet wouldn’t be able to determine). So I decided to start a fall-calving herd. I picked out the best cows, ones the vet said were reproductively sound even though they were open. And I moved them to my farm and borrowed one of my parents’ bulls to breed any cows which weren’t bred by the neighbor’s bull. The neighbor’s bull was black and he sired the black calves last year. I had 8 black calves and 4 red ones. I wasn’t sure where this herd would be, as I didn’t think I had room for them on my farm during the grazing months. Luckily I was able to rent a neighbor’s wooded pasture from May 1st to November 1st. After November 1st I bring them home and turn the bull out with them. I wasn’t sure how the small calves would handle the winter, but last winter they did fine, nursing their mothers and eating some hay. I weaned the calves from their moms at the end of April. The weaned calves really took off on the spring pastures. They spent the summer grazing with the feeder steers. And now I’ve started butchering them weighing around 1000 lbs. I think the economics of the fall-born calves is better than purchasing feeder steers, because although the cow and calf eat more hay than a feeder steer, I don’t have to spend the money purchasing the weaned calf. Furthermore, the cow will have a salvage value at the end of her productive life. 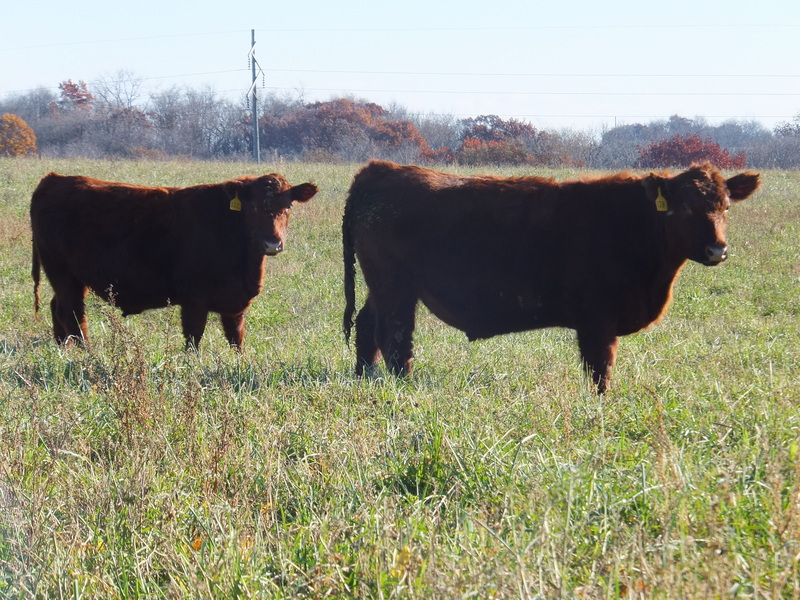 If I didn’t need to keep a consistent supply of beef, and could just sell quarters to customers at one time in the fall, I think I would only have a fall-calving herd and market all the fall-born calves the following November. What makes both systems economical is taking the animals through only one winter. 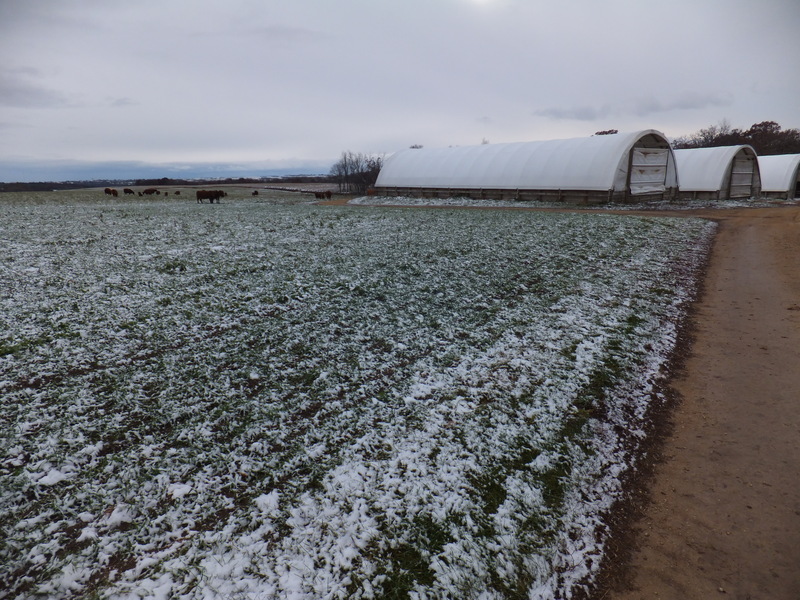 Feed is a huge cost in beef production, and the cost of winter feed dwarfs the cost of summer pasture. The photos were taken recently and show two, fifteen month old fall-born calves above and below, from a different angle. They weigh about a thousand lbs and will be butchered in a few weeks. 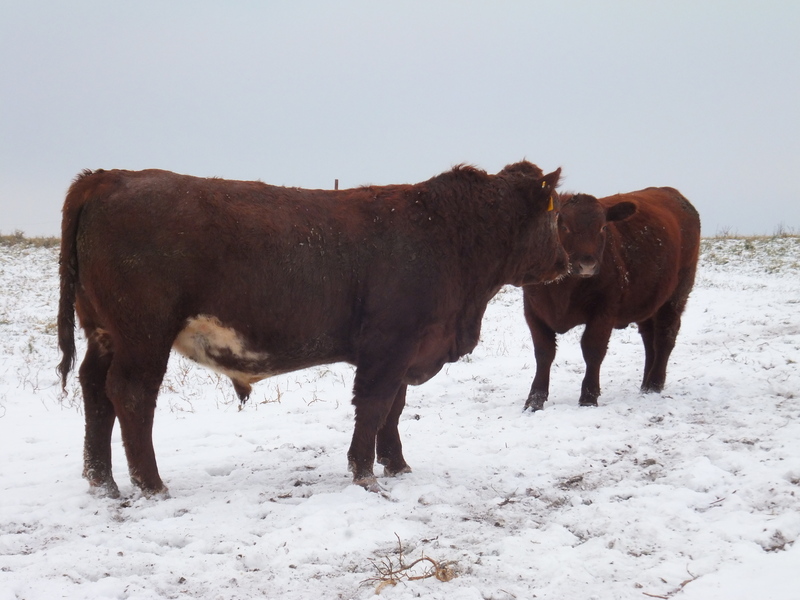 The top photo also shows one of my fall-calving cows on the right. She is eight years old and had something wrong with her udder so I took her calf away from her. She is one of the biggest cows, I’m sure weighing over 1500 lbs. She also will be butchered soon. November 11th, 2013. Here is another photo of the rye, now at six weeks. It hasn’t grown much since it was two weeks old. In the background you can see my fall-calving cows with calves. I moved them home from the summer pasture and now they’re grazing hay fields on the south side of my farm. The bull in the photo has been with the cows for a week, which will give us August and September calves next year. This spring has been as late as last spring was early. The grass finally started growing and I turned them out yesterday. The steers stayed on my pasture, and the fall-calving cows went to the rented pasture. In the foreground you can see one of the fall heifer calves. In the background you can see the neighbor’s dairy cows. I wanted a few more cattle on the rented pasture, so I decided to try an experiment and kept the four fall heifer calves with their mothers to see if the cows would self-wean before they calved again in August/September. The eight fall steer calves were separated from their mothers. The cows and steers which were weaned are bawling for each other. I don’t think the calves were getting much milk anymore, so the discomfort is probably psychological. 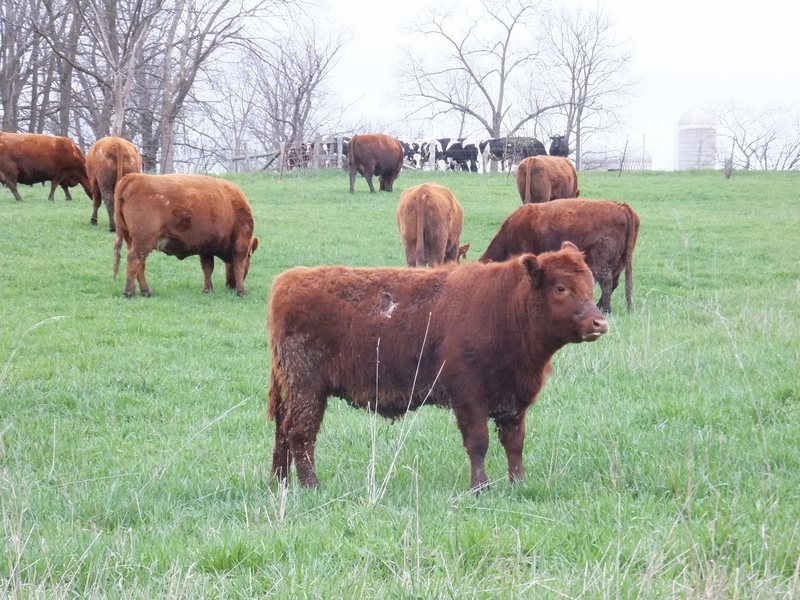 I wanted to house my fall-calving cows with calves on the south side of my farm this winter. I couldn’t figure out a good way to walk them back over to where the heated Ritchie waterer is, so I purchased the 110 gallon tank, pictured above. 465 is the cow in the photo. She is my oldest cow at nine years old. Coincidentally, she was the model cow in last year’s post about the Ritchie waterer. 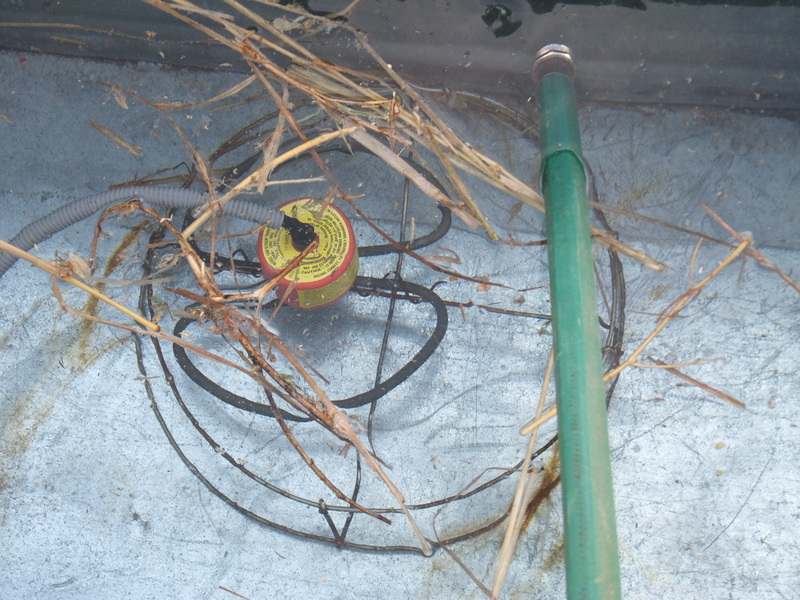 I needed a way to keep the water thawed. So I purchased a sinking tank de-icer. The first cold night it blew a 15 amp fuse. I thought I was in for trouble, but I replaced it with a 20 amp fuse and it has worked flawlessly since. One drawback is I fill the tank with a hose at least twice per day, draining the hose well after each fill. 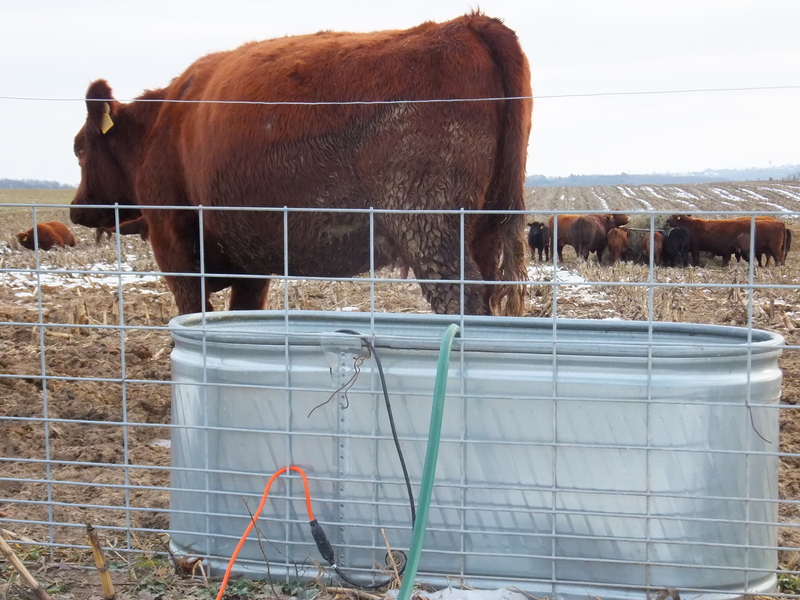 I figure each cow is drinking between 15 and 20 gallons per day. I don’t notice the calves drinking much because they are still nursing their mothers. In the photo below you can see the herd eating hay out of a feeder. 13 cows, 12 calves, and 1 bull are eating a half of a round bale of hay per day. If similar quality hay is valued at $200 per ton, and a round bale is 1500 lbs, then the herd is eating $75 worth of hay per day. You are currently browsing the archives for the Curious cattle category.